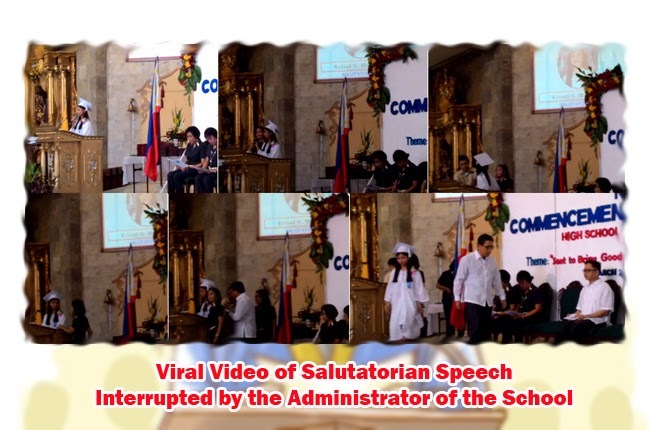 A video clip of a graduation speech of a salutatorian had gone viral, not only because to the superb delivery filled with meaning and emotions, but also it had gone controversial as the school administration tried to stop her from finishing her speech. The batch salutatorian of Sto. Niño Parochial School, Krisel Mallari started to deliver the first lines of her speech. It is evident that when she reached the cryptic part of her speech, the school personnel sitting on the stage caught the attention of the program’s announcer. The announcer then immediately walked over to Mallari and interrupted her. Mallari said in her speech that she had studied hard each year, believeing in fair system of the school. She continued by saying that this year, as her studies drew to a close, the finish line was about to be crossed, yet red line symbolizing her victory had suddenly vanished. Did it vanished or someone had deliberately took it. It was in this part or the message that the announcer had tried to interrupt Mallari. However, instead of stopping and going back to her seat, Mallari stood her ground and continued on even if the other school authorities had insisted that her speech must stop short. She said that many had turned a blind eye in a system that was both questionable and unfair. She shared that she did not succumb in the system and tried to fight in what she believed was true, standing her ground as a courageous and God-fearing Filipino. She then shared that gossips tarnished her image. A teacher then came up to her and gave her another speech to deliver instead of the one she was reading. In an interview with ABSCBN news, Mallari said that the speech she delivered was different from the one she gave to the school administration to check. It she handed the one she wanted to deliver in the graduation rites, it would never be approved as it contains about a controversy on a cheating incident in the school. In the school program, Mallari was suppose to be given the Best in in Religion award but the school withheld it. For Mallari, it is better to have her freedom of speech. The said video had been viewed more than 1.5 million times after it was uploaded on March 21, 2015.